CRE8 has worked with Cloud4 Computers since 2012 and we enjoy a great relationship, with both businesses supporting each other regularly. 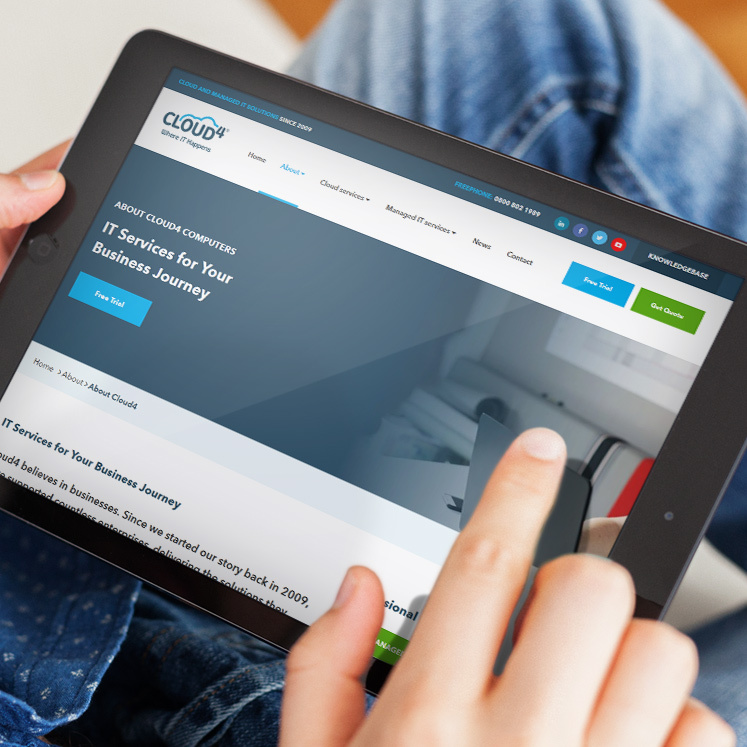 Growing to incorporate new Managed IT services, Cloud4 asked us to develop a new website which communicated the business’ brand values and USPs. 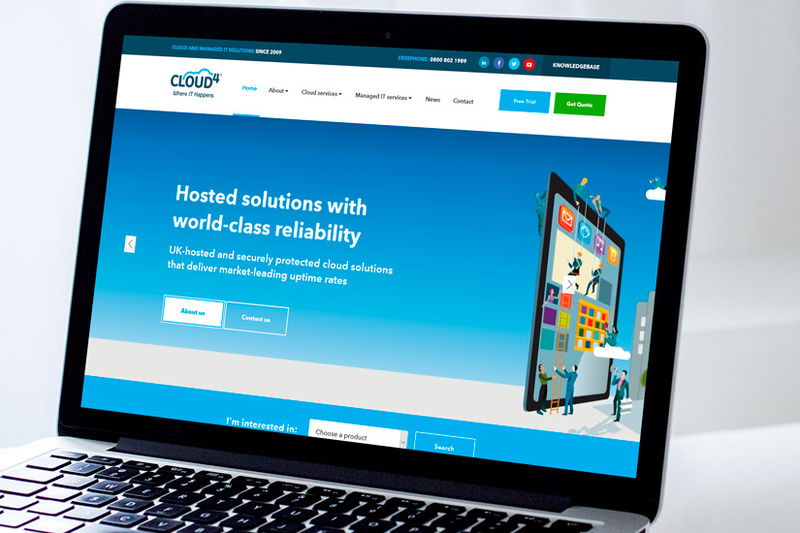 Since 2009, Cloud4 has delivered some of the UK’s leading cloud-hosted solutions, including Hosted Exchange, Hosted Desktop and Online Backup, as well as VoIP systems and other cloud-hosted services that enable their clients to work wherever they are with great security and reliability. With Managed IT services becoming increasingly important to our client, CRE8 worked with the Cloud4 team to define Cloud4’s updated brand proposition and to write, design and develop a new website that reflects this maturing and growing business. Over the last 12 months, Cloud4’s business has grown and evolved. Alongside their cloud-hosted solutions, Cloud4 now delivers tailored Managed IT services to clients across the North West, including local schools and businesses of all sizes. Cloud4 knew that their website was out of date, with styles and content that needed a refresh. The introduction of Managed IT services was crucial to this project; not only did we need to incorporate sections into the new website to detail Cloud4’s delivery, but we needed to understand how to distinguish them from their competition. As always, we approached this project with a strong emphasis on face-to-face communication. We benefited from strong relationships already, enabling us to work well as a team throughout every stage. Many people now know what a cloud-hosted mailbox or a remote desktop is, and we decided to avoid over-complicating the website with too much technical information. Instead, our creative team developed website wireframes and graphical designs for Cloud4 which represented the client’s focused, professional and growing business. Incorporating clear calls to action and great user experience, we also updated content to communicate Cloud4’s strong and unique brand proposition. Both we and Cloud4 are delighted with the finished product! The website incorporates new team imagery, a fresh focus on Cloud4’s team, personal approach and tailored, customer-centred way of working, and a design and build that encourages user interaction to generate leads and enquiries. Its professional but approachable style reflects Cloud4 perfectly. The team provides Managed IT services to large, city-centre clients and it was important to all of us to communicate clearly not just the work Cloud4 does but the way the team delivers it. We’re looking forward to continuing our long working relationship with the Cloud4 team. Thanks for choosing CRE8! Next PostNext Welcome to CRE8: Your Marketing Goodguys!